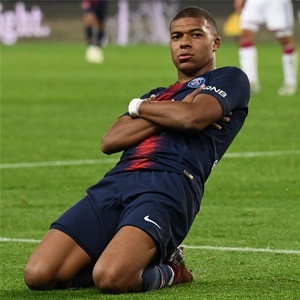 Paris - Kylian Mbappe fired Paris Saint-Germain to their eighth straight Ligue 1 win with a stunning goal that earned the champions a 1-0 victory at Toulouse on Sunday and kept them miles clear at the top of the league. "It brought a great deal of joy to our fans, I'm sure of that." Coach Thomas Tuchel said he was delighted that the runaway leaders have not been tempted to take their foot off the gas. "Many of our players were away in the international break and there was a bit of fatigue in some of them," said the German. "It could have been tempting to relax, especially with the lead we have in the league, but nobody does it and I like that." Mbappe's goal was the highlight of a dull game which was otherwise lit up by a cheeky PSG fan sneaking onto the pitch to snap a selfie with the striker. The video assistant referee system ruled out Marquinhos' tap-in just before half-time after Mbappe was judged offside, and the runaway league leaders threatened little other than that. But three strikes in seven minutes from Rafael Leao, Nicolas Pepe from the spot and Jonathan Bamba's fired Christophe Galtier's gutsy outfit to an impressive turnaround. It was Leonardo Jardim's first defeat since returning to the helm eight games ago when Thierry Henry was fired. "We're back in a relegation scrap," Jardim lamented. "This is a message to all of us to do better. We are only seven points clear of the drop zone and that's nothing, just three matches."